Preventing machine breakdown is the biggest challenge that manufacturers face. Even as technology cruises ahead with its never-ending list of innovations, a majority of manufacturers are still a tad behind when it comes to adopting suitable technology to solve this challenge. But slowly and steadily, they are taking notice of advancements that are happening around them and taking steps to adopt to them in their organization. In one of our previous blog on Industrial Internet of Things (IIOT), we had highlighted how IIOT technologies have the capability to change the way manufacturers operate their businesses. Predictive Analysis is one of the benefit subset of IIOT and manufacturers are increasingly realizing its value for their businesses. Machines and other manufacturing equipment are embedded with sensors or connected to machine controller devices. These devices continuously monitor parameters such as temperature of the machine component, sound arising from machine, vibrations, time taken for job processing, materials consumed, scrap generated weight etc. For each parameter, there is a specific benchmark depending on the type of machine or equipment. The data is continuously fed to a cloud-based software that analyses it and presents the useful information to different departments such as shop-floor, plant management, shop owner, supply chain etc. This data helps manufacturers to predict breakdown of machines/machine component and thereby prevent production disruption. It helps personnel make subtle changes to production schedules to optimize production, track raw material consumption and arrive at procurement date, track machine utilization and enable the shop-floor to make changes to job allocation accordingly etc. 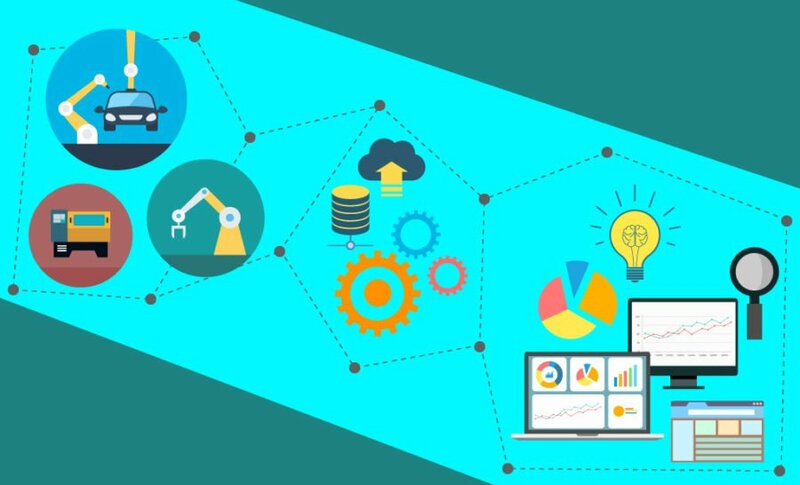 Let us look at how predictive analytics plays a role in different areas of manufacturing planning and operations. Gone are the days when factory workers waited for a machine component to break down and then fix it, delaying production and costing the organization a lot of money. Manufacturers can now analyze data collected from their operational processes and predict what machine component might break down at what precise day/time. This helps them to change the hardware at the optimum time, thereby preventing the breakdown and reducing costs associated with repair and production delay. This also increase machine uptime leading to increased production time and efficiency. Predictive Analysis in conjunction with ERP provides a minefield of data to analyze. With the help of sales data already recorded in the ERP, the analytical system can predict future demand by analyzing data patterns. It also detects factors that might have played a crucial role in influencing sales and apply them in forecasting future sales. Now that you have your sales number, you can even drill down to the specifics such as raw material required, total production hours, manpower needed etc. By detecting potential defects in machine equipment/assets and prompting immediate rectification, predictive analysis ensures zero damage to critical human life and production environment. This further prevents associated human/factory insurance costs, equipment damage, production downtime, delayed shipment, eventual customer dissatisfaction and damaged market reputation. Predictive Analysis greatly enhances your relationship with your suppliers, partners and customers. Including tracking technology in your moveable assets and products help you collect and analyze data patterns that tell your suppliers when to replenish your raw material stocks. Even after a product is sold, the relevant tracking helps you to detect potential issues, breakdowns and solve it even before it happens. This greatly enhances customer trust & reputation and helps build a great relationship with your customers. Machine data can say a lot about the quality of a product. Data parameters such as machine uptime, scrap generated, inventory consumed, machine health data etc. show patterns that help determine the quality of the manufacturer product. Also, the data can be used to detect loopholes in production and help optimize workflows and business processes. Manufacturers can now track who bought their products, and how their products are getting used. This demographic information helps them to make subtle design changes in their existing products and also roll out new products for a specific nature of customers. Also knowing beforehand as to when a product batch will break down helps them alert the customers and efficiently manage product damage and warranty related issues. Predictive Analysis is evolving and with the inclusion of Big Data and Machine Learning technology, manufacturers can get valuable business insights, accurate sales forecasts, customer behavior etc. It has the potential to change the manner in which they produce, market, sell their goods, and eventually provide a customer experience based on each customer’s preference and needs. Manufacturers can finally realize the age old adage, “Prevention is better than cure”, which they have been trying for years and eventually get a much needed push from technology and innovation.